Peel and grate raw mangoes. Take a big bowl and mix together grated mango, salt, and turmeric powder and keep aside for 2 hour. Squeeze out the the water from grated mango, and keep aside the water and grated mangoes separately. 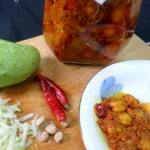 Wipe the chickpeas with a moist cloth and soak them with fenugreek seeds in the mango water overnight. Keep the grated mangoes in the refrigerator. Next day add fenugreek powder, chilli powder, asafoetida, fennel seeds, nigella seeds, whole red chillies (broken into 2, 3 pieces) soaked chickpeas and fenugreek seeds into the grated mango and mix well. You can add also add 2 tender mango seeds chopped in small pieces. Heat the mustard oil till smoking point. Let it cool down completely then add in the mango mixture. Keep in a sterilized glass jar, and put in sunlight for few hours daily for 1 week. Your pickle is ready to eat after 1 week. Store in a cool and dry place and enjoy for up to 1 year. Remember to keep the pickle covered with oil, else keep refrigerated. Serving suggestions - serve with any time of paratha, poori, rice or with any meal.